I want to go to battery park, NewYork from Penn station, Newyork. I searched Google map for direction. I have some doubts about that route. 2.It shows 19 min journey. So 19 min journey with 12 stops??? Can any one explain the name of those stops? Now that's odd, because if you look at the subway map, you'll see that the 2 train isn't supposed to go to South Ferry at all. It just so happens that some temporary nighttime maintenance work means that the 2 operates as a local and terminates at South Ferry instead of going to Brooklyn. Google Maps knows about the change, so it suggests it as an option. If you change the "Depart At" setting to tomorrow morning, when the maintenance won't be taking place, you'll see that the 2 train is no longer given as an option. It's a 16 minute ride with 12 intermediate stops. 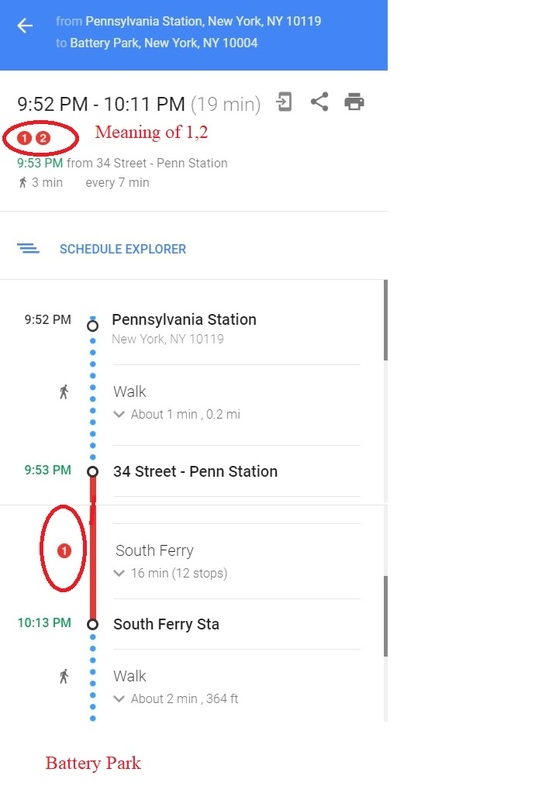 On your phone, if you tap right where it says "16 min (12 stops)," Google Maps will show you the names of the stops you'll be going through. You can also see this on the subway map and inside the subway cars. Not the answer you're looking for? Browse other questions tagged trains public-transport new-york-city train-stations or ask your own question.